As if the recent flooding in Genoa wasn’t tragic enough, there is talk after Genoa’s Sunday loss to Cesena of their always entertaining coach, Alberto Malesani, getting the axe. Malesani himself has some interesting theories about why, but then again he is an interesting guy. So we’ll start today with a press conference video that put him on the map of crazy managers. Don’t get me wrong, Malesani may be as crazy as that hair of his and quite the character, but he’s a decent coach, and I can only hope that even with a loss to us on Friday, he will get to stay at Genoa. Certainly, his players have come out in support of him. In 9th place on 15th points with a game in hand at this point in the season, one would hope he would be shown a bit of mercy. Speaking of characters, how about the riddle of the day? What do a Padawan, a b#%ch, and a Wolverine all have in common? The answer is that they all play for Genoa. The force was to strong with this one, he will be suspended for our match. 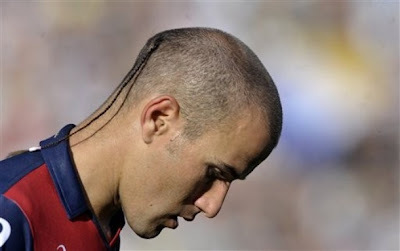 Rodrigo Palacio is the Padawan, thus nicknamed for that tiny silly braid he wears, even with a growing bald spot on the top of his head. But don’t be fooled by the ridiculous hair. His powers on goal are more Jedi than student, and make him Genoa’s top striker thus far with 5 goals this season. Fortunately for us, though, the force was strong with him and he will be suspended for our match. The b#%ch is one Juraj Kucka, a Slovakian whose last name apparently means b#%ch in Serbian. Personally, it may prove to be appropriate, as that midfielder b#%ch is co-owned by Inter and is rumored to be wearing the Nerazzurri come January. Wolverine is the nickname given former Fiorentina keeper Sebastian Frey. Having suffered injury and a subsequent slight dip in form, the change to Genoa seems to have returned him to full strength, unfortunately for us. But having dispatched of his brother Nicolas’ team on Sunday, it would be only fair to treat him similarly. We may also face our former friend Kaladze as well as our on loan Merkel. Kaladze is a character who left a bad taste in our mouths, but found his form at Genoa and has become a stalwart in defense. Merkel is quickly developing his character and his mad skills, having been given the playing time he lacked at Milan. Now then… against Cesena, Malesani lined up Frey; Kaladze, Moretti, Granqvist; Constant, Veloso, Merkel, Rossi, Mesto; with Palacio, and Caracciolo up front in Genoa’s infamous 3-5-2. Obviously, Palacio will not play, so I will be curious to see who he replaces him with. Milan are without Nesta now until the new year, and I understand that Mexes may be ready for this match, but after Yepes’ strong performance against his former team, Chievo, he may deputize instead, ahead of the (dare I say) in form Bonera. Abate and Silva should be certain, but left back roulette is back on. Chose your own character. The midfield of Aquilani, van Bommel, Nocerino, and Boateng in the hole has got to be Allegri’s inked in lineup, but he may choose to rest some players ahead of our Champions League match with Plzen next week. The Pato-Ibra combination was lethal for Chievo, but we have some other characters who might actually kill for a little playing time, too. I implore you , Allegri! Don't let him leave in January. Play the man! 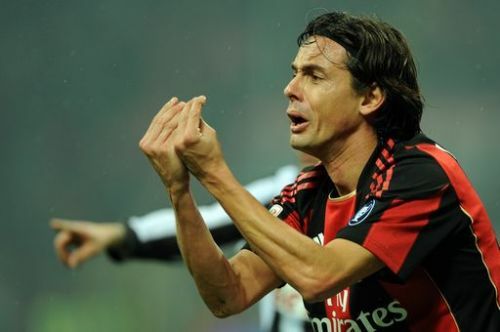 Now this is where I put in my weekly plea to Allegri: Give Pippo a chance!! Enough said. I may have had a bit of fun at Genoa’s expense, but I do both respect and fear them. They drew with Juventus away and beat both Lazio and Roma, amongst others. And remember, they are the providers of all of so many of our transfer and loan dreams. Captain Marco Rossi has also said glowing things about Cassano and Gattuso, commending them for their courage in the face of such injuries, and has invited them to come to the match so he can shake their hands in person Now that’s character. But while the people of Genoa have had to endure so much recently with the terrible flooding and loss of lives, they may just have to endure one more little tragedy in the form of a loss this Friday. Because you don’t win titles by giving handicaps. Besides, I don’t think Genoa would want it that way. And doesn’t losing build character?